Just wanted to start this off by saying that I still listen to "Love Me Like You Do" on the daily. 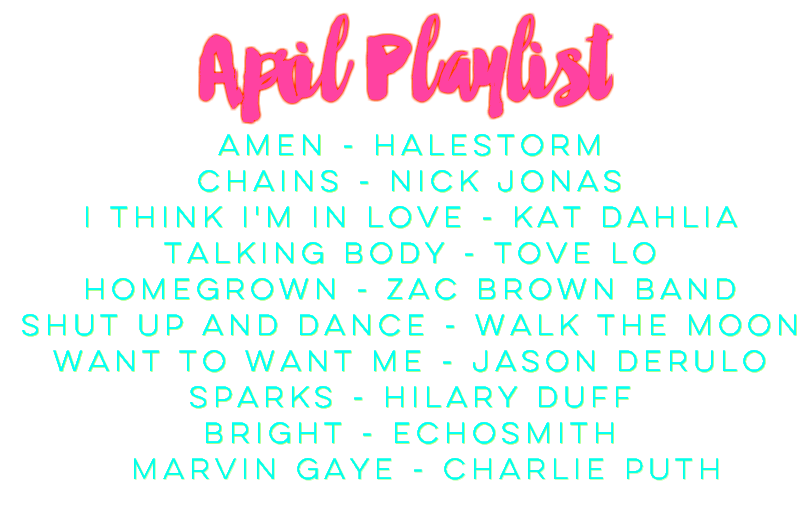 But listening to one song on repeat maybe isn't healthy, so here are some fresh jams I found for April! Y'all might know that I am a big Meghan Trainor fan, and when I heard she was on this track by Charlie Puth I obvi had to listen to it and ended up really digging it. Number one earworm for the month goes to "Talking Body" like idk man but that song is catchy as heck. And since my fave band Halestorm is releasing their new album in just a few days I had to put a new one from them on here! Can't wait to listen to that on loop while trying to find someone to go see them in concert with me. And next month there's probably gonna be a heck of a lot more country up in here, but right now it's all about ZBB serving up spring and that's fine by me. Happy listening! THAT'S SO CUTE I want to hear!